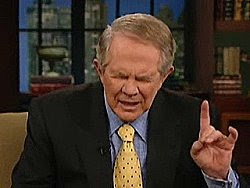 Religious Douchebags: Robertson: Haiti Had "pact with devil"
And you know, Christy, something happened a long time ago in Haiti, and people might not want to talk about it, they were under the heel of the French, uh, you know, Napoleon the third and whatever, and they got together and swore a pact to the devil, they said, we will serve you, if you get us free from the Prince, true story. And so the devil said, 'OK, it's a deal.' And they kicked the French out, the Haitians revolted and got themselves free, and ever since they have been cursed by one thing after the other. . .